【Multi-function Use】The bathroom wall cabinet is ideal for bathroom, bedroom, living room or kitchen. 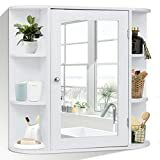 It features enclosed shelf with a mirror door, the mirror door can be opened, there is a lot of space for you to store items. And It also has two open shelves to place towels, soap, tissues and other decorative items. In addition you can also put some green small plants on the open shelves to make your item neat and beautiful. 【Space-saving】The Tangkula bathroom wall cabinet is a perfect storage solution for homes. It's design maximizes the space of your room. It can be assembled on wall and comes space-saving, provides extra storage without taking up valuable floor space. 【Simple and Beautiful Design】The Tangkula bathroom wall cabinet has a simple and stylish design, woody material is full of texture. The design of the mirror door is unique. Both sides of the shelf is not only practical, but also beautiful in appearance. It is conveniently store towels, medicines ,tableware or other things, meanwhile to add a modern feeling to your home. It is a ideal option for you. 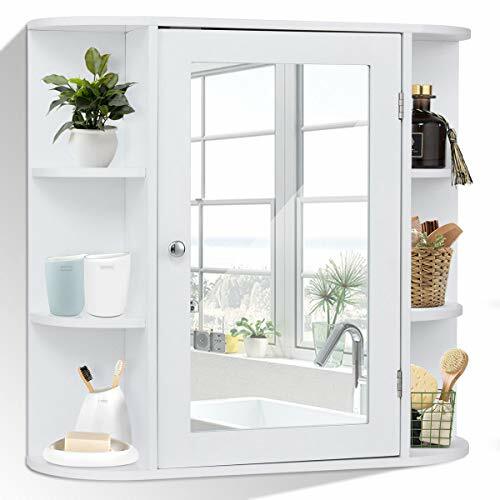 【Moisture Proof Design】 The Tangkula bathroom wall cabinet is using a premium pure white painted process that is waterproof and moisture resistant. Suitable for humid environments, such as bathrooms or toilets. In addition, the white paint finish makes it easy to clean with a damp cloth.